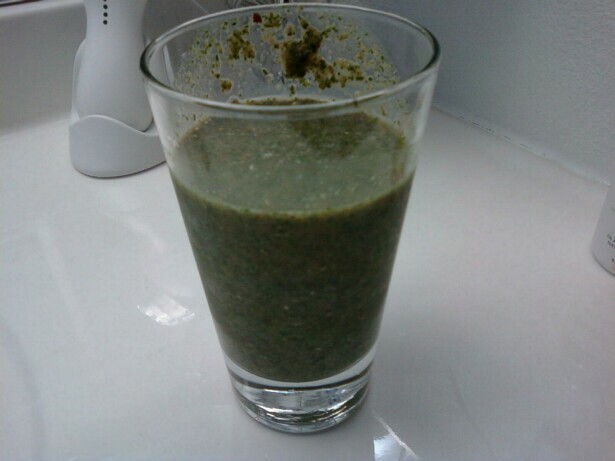 Today’s green smoothie was definitely green! I decided that I could up the ante to two cups today, and it came out great. This was almost like eating an energy bar in two ways. The first, well, I’m still using a food processor, so it’s still chewing each sip. The second, I added in a tiny bit of cashews and raisins at the end, so they didn’t get processed as much, and added a nice texture to my chewing! : ) Incidentally, it seemed like that last raisin addition kind of stressed out my cuisinart. I got a little worried as it struggled, and that’s when I decided that the extra texture would be just fine. Also, I went ahead and ordered one the refurbished vitamixs yesterday. They give you a 30 day guarantee, so that’s plenty of time for me to make an informed decision when it arrives. Apparently they make each one to order, so it won’t be here for at least a couple of weeks.